Allen County-Scottsville kicked off the 50th season of Patriot football with a lopsided 45-18 win over the Adair County Indians last Saturday in the Forcht Bank Bowl on the turf at Campbellsville University, The Patriots took advantage of three first half Indian special teams miscues and used a strong first half defensive effort to cruise their second consecutive opening game win. Offensively, the quarterback tandem of junior Zane Ward and sophomore Trace McIntyre successfully guided a young Patriot offensive unit. Ward and McIntyre alternated at the quarterback spot. The pair combined to complete six passes on the night for 111 yards and a touchdown. “Both are doing a really good job,” coach Hood explained. “As we graded the film, there was about a three-play difference between them. There was about a two-point percentage in plus and minus between them. Both had three touchdown drives when they were in. It’s very even. We are not satisfied yet on making the decision with just one and we probably won’t be this week. Hopefully, as we push forward one will take a little more control and we’ll have a single starter. Senior Kelly Weger provided a spark with a nine-carry, 70-yard game, dashing through the holes created by the AC-S offensive line. Weger’s night---coupled with a 54-yard kickoff return---helped the senior earn Player of the Game accolades---an award presented by the National Guard to a player from each team. AC-S fumbled the ball on their opening drive but quickly regrouped to start a first-half scoring tsunami. The miscue was followed by AC-S’s defensive holding the Indians on downs inside their own 30-yard line. The Patriots’ needed just six plays to march 74 yards and find the end zone on their first scoring drive of the season. Weger’s one-yard run at the 6:26 mark of the first frame gave AC-S a 6-0 lead. Freshman kicker Thorny Walker missed the point-after. Adair County would be stopped quickly on their next series and forced to punt. The kick was short and began to bounce near midfield. Adair County’s players overran the ball, allowing an alert Carter Holland to scoop the ball on a bounce. Holland seized the opportunity, scooped the ball up, and raced untouched down the Adair County sideline to score on the 49-yard return. The touchdown at the 3;46 mark of the first lifted AC-S to a 12-0 lead following a blocked PAT. A second punting miscue led to AC-S’s third score. This time, a hard-charging Dalton Cline raced to the punter and blocked the kick. The ball bounced to the Adair County five-yard line before Yancy Gardner made the recovery. Moments later, Ward kept the ball and scored on a five-yard run at the 1:53 mark of the first quarter. Walker drilled the PAT to give the Patriots a 19-0 lead. The long opening half for the Indians got worse. Unable to move the ball against the Patriot defense, the Indians faced a third punting situation early in the second quarter. This time, a high snap from center sailed over the punter’s head. The result would see AC-S taking possession at the Adair County 21-yard line. Five plays later, Cayden Ross would score on the jet sweep, giving the Patriots a 25-0 lead by the 8:06 point of the second. AC-S would have their own special team’s breakdown on the following play. On the kickoff, the Indians Cameron Harmon raced 86 yards down the Adair sideline for a return touchdown. The PAT at the 7:53 mark of the first was unsuccessful but the Indians were on the board. Weger followed with his 54 yard return, a play that allowed his team to start the following drive at the Indians’ 23-yard line. Four plays later, Ward hooked up with senior wide out Dakota Harrison for a 17-yard pass play. Walker’s kick lifted the Patriots to a 32-6 lead at the 6:29 mark of the second. The offensive showcase would continue with both team’s scoring inside the final minute of the first half. Late in the half, the Indians stopped the Patriots, forcing Hunter foster to punt for the first time this season. Foster’s towering boot sailed 64 yards, over the head of the Adair County’s returners. In an attempt to make something happen, the ball was mishandled by Adair County. The live ball was recovered by Patriot junior Noah Kinslow. AC-S took possession at their eight-yard line. Two plays later, Weger scored on an eight-yard run. Walker’s PAT gave the Patriots a 39-6 lead with 53.7 seconds left in the half. Adair County countered with a quick scoring drive. The highlights included two pass plays capped off by Aaron Peck hooking up with Jeremy Wile for a 30-yard touchdown with 15.6 left in the first half. The second half would turn into more of a defensive struggle as each team’s offenses were challenged to move the ball. The Patriots final score of the game came with 2:55 left in the third quarter. After a 54-yard foster punt left the Indians pinned deep on their end of the field, a 10-yard sack by Foster led to the Indians’ punting from their end zone. The short kick gave AC-S possession at the Indians’ 33-yard line. After a pass play to Jacob Lightfoot, brought the ball to inside the 10-yard line, a seven yard run by Weger was followed by Peyton Huff scoring on a one-yard plunge. AC-S led 45-12 with 2:55 left in the third. The Indians threatened once and scored once in the second. After moving the ball to deep inside the Patriots territory, a pass to the end zone was short and intercepted by AC-S defensive back Nick Cooper. The sophomore’s play ended the threat. Later, Adair County would score a final time as Peck scored on a 10-yard run with 8:35 left in the game. 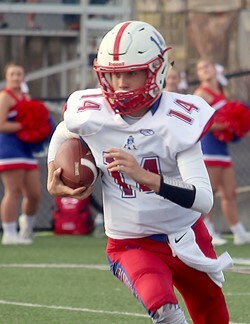 Adair County’s offensive—which generated 177 yards passing and 76 yards on the ground---was able to move the ball against AC-S especially in the second half. However, coach Hood is not overly concerned. Hood is the first to admit work remains to be done as the team heads into the weeks ahead. The Patriots (1-0) will return to the road this Friday traveling to Barren County. The Patriots and Trojans will meet for the 26th time in the series. AC-S has one the past four match-ups. Kickoff is at 7 p.m. on the new turf at Barren County (0-1).